Monday Man-Day: Real Men Drink Coffee? This might be the most ridiculous Man-Day topic ever. Please just indulge me. Back to the point. He said he actually sometime’s gets a Vanilla Latte, but he wasn’t sure if it was a Skinny Vanilla Latte or not. The whole conversation kind of just cracked me up. 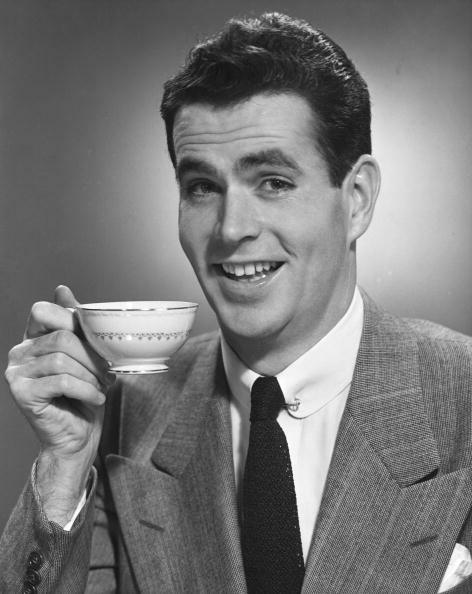 So anyway, here’s the conversation I want to have: Do the males in your life drink coffee? Do they get all fancy about it with sugars, milks, and specialty orders? Do you think it’s weird if guys do that? I guess I kind of do, just because I’ve never been around males that enjoy coffee. But now I feel all bad about being sexist. I don’t think regular coffee is girly at all! I think “skinny” anything/teas/fraps and the like are, but not just a coffee or espresso with basic mix ins like milk and sugar. I only drink black coffee, no milk, no sugar, no flavors. That’s what my dad drinks as well. I should add my dad is 100% italian and espresso is one of his favorite things, he has it every day after dinner. But mostly, I think of coffee as a taste thing. My guys friends that are coffee drinkers are particular about the beans that they get (but so am I cause if you’re drinking it black you want good beans! ), but I’d probably look at them funny if they started talking about syrups and sugars and flavoring. The guys in my life just drink black coffee or Americanos–nothing froo froo. lol. My boyfriend likes his with half and half on occasion. A lot of my guy friends drink coffee, but it’s usually black and they make it themselves. One of my really good friends, is gay and I laugh every time I see him with huge sunglasses clutching onto his coffee, just because it reminds me of Rachel Zoe haha. My Dad is a complete latte junkie. He has a couple a day (one is half-caf or decaf though). My husband has coffee with milk in the morning….well, it’s more like has milk with some coffee in it…. I don’t think it’s weird for a guy to drink a latte! Maybe it’s just because my Dad always drinks them and he’s a man’s man…but yeah. I introduced my ex-boyfriend to starbucks and he quickly became a frappacino MONSTER. Any time of the day or night he would ask me to go to starbucks. At 9pm before work the next day, Umm no I wanted to go to sleep! Definitely turned me off, seemed awfully feminine to me. I am sure there are guys who order frapps and are a little less crazy!! Hey! I just discovered you blog today and I LOVE it! My man HATES coffee! I brew my own up every morning and always try to make him take a swig because it is so darn good but he refuses!! THe males in my life love coffee and aren’t scared to get fancy about it! My man gets a venti dark roast coffee. every. single. time. In college I would regularly refer to non-fat sugar free vanilla lattes as the “sorority girl drink” (and I was a sorority girl, mind you). I found it hysterical when my man-friends would get these pricey many-meal-point drinks and I would get my cheap drip occasionally with a splash of soy. I don’t actually care… I’m sure my stepfather would be horribly offended if I called his heavily creamed and sugared coffee anything close to “latte,” but he is from the down-home-all-my-family-lives-on-the-same-block rural rural Kentucky where heaven forbid a man have a sophisticated coffee palate…. Tee hee. No offense to anyone. I love the fancy-coffee-drinking men in my life!! The men in my family get vanilla lattes with soy milk or mocha frappuccinos. I don’t really find it weird- I think they should drink what they like, especially if it’s a $5 purchase. I drink coffee with stevia in it and my husband drinks it(very seldom, if he does) with LOTS of sugar and creamer..
My dad drinks instant coffee, haha. 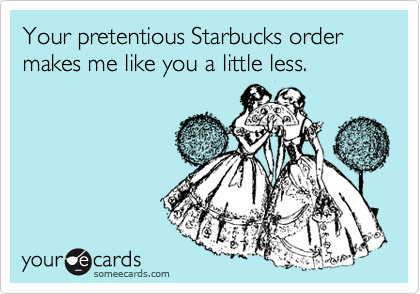 One of my best guy friends loves skinny no-whip cinnamon dolce lattes, but then again, he’s gay, so…. First of all, Monday Man-Day confuses me. I thought there was a dude guest posting on Mondays. But then sometimes it seems like it’s you. Confused I am, yes. Inyhoo, coffee. Every guy I know drinks it. They usually do not opt for the girly drinks. Some guys drink it black, I think just so they can say they do. Everyone I know drinks coffee… I don’t like Starbucks Coffee… I find it taste the same as the stuff you make @ home and cost too much!